Early-stage startup founders have a lot on their minds. Are people using my product? How are they using it? Are they returning to get value week over week? When we were first starting out, my co-founders and I did not understand how important these questions were or how to use analytics to find the answers. As a result, we spent 1.5 years and $500,000 dollars to unfortunately fail in our pursuit of product-market fit. However, the story doesn’t end there. We realized that there wasn’t an easy way for our early startups to power all of our tools with the same data. So we decided to build a way. Fast forward to today, and Segment has helped tens of thousands of companies instrument and install their first marketing and analytics stack. We’ve seen how critical a solid data foundation and analytics can be to the success of an early startup (us included). That's why we are launching the Segment Startup Program to help early-stage startups get started on the right track. Early startups have been using our free Developer Plan for years to collect and send data to over 250 tools. But we believe we are well-positioned to help the startup community a lot more. 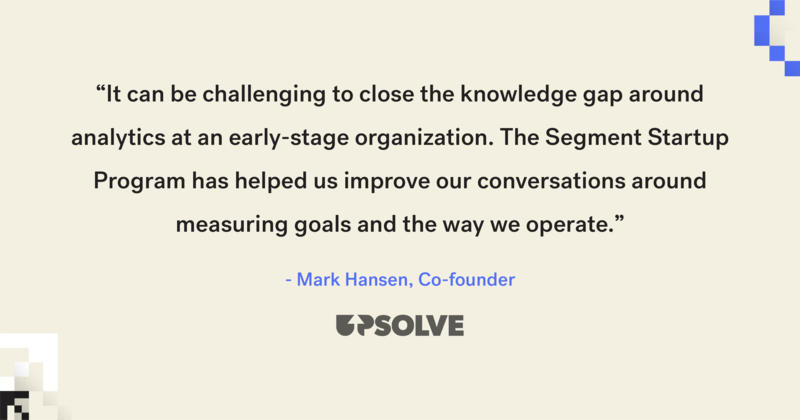 Today we’re opening up the Segment Startup Program, an initiative dedicated to helping early-stage startups use data to reach product-market fit and grow their business. The program offers startups a free Team Plan (up to $25,000 annual value), which includes significantly more monthly tracked users than the Developer Plan as well as unlimited sources and destinations. The program also includes exclusive deals from our partners like AWS, Google, Mode, Intercom, and Customer.io, and access to resources on important topics like data collection, analytics, and product-market fit. The Segment Startup Program is open to early-stage startups that are less than two years old and have raised less than $5M in funding. The program helps companies power all of their apps with the same data, implement their analytics, and install the tools they need to reach product-market fit. A free Segment Team Plan (up to $25,000 annual value) that includes unlimited sources, unlimited destinations, and additional startup office hours. Access to over $1M in software credits from our partners, including marketing and analytics tools like Mode, Customer.io, Intercom, Amplitude, Google BigQuery, and AWS. 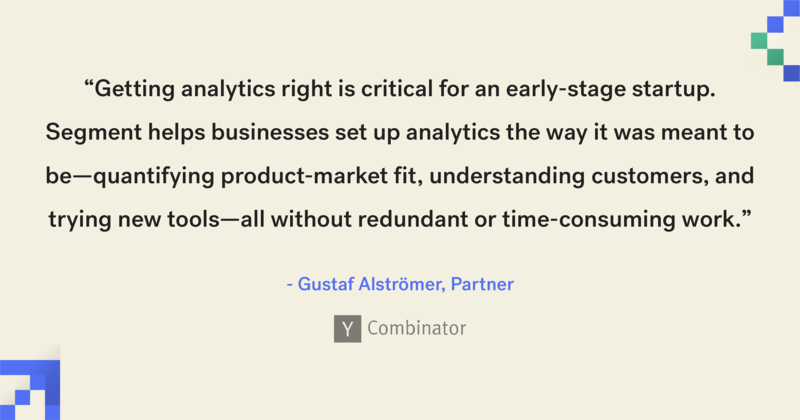 Educational resources including our Analytics Academy aimed at helping early-stage founders get started on the right path for analytics, product-market fit, customer data, and building a growth stack. If you’re new to Segment or you’re an existing Segment customer that meets our eligibility requirements, you can apply online and get started immediately. Are you an accelerator, incubator, co-working space, or venture capital fund? We’d love to work together to unlock even larger offers for your startups. Apply here to join the Segment Startup Program’s network.